Camera layers, Lights, Sound, these layers will never have effects applied to them, why would we display an empty effects panel and waste AE screen real-estate, while it could be the perfect place to control the properties for these layers? 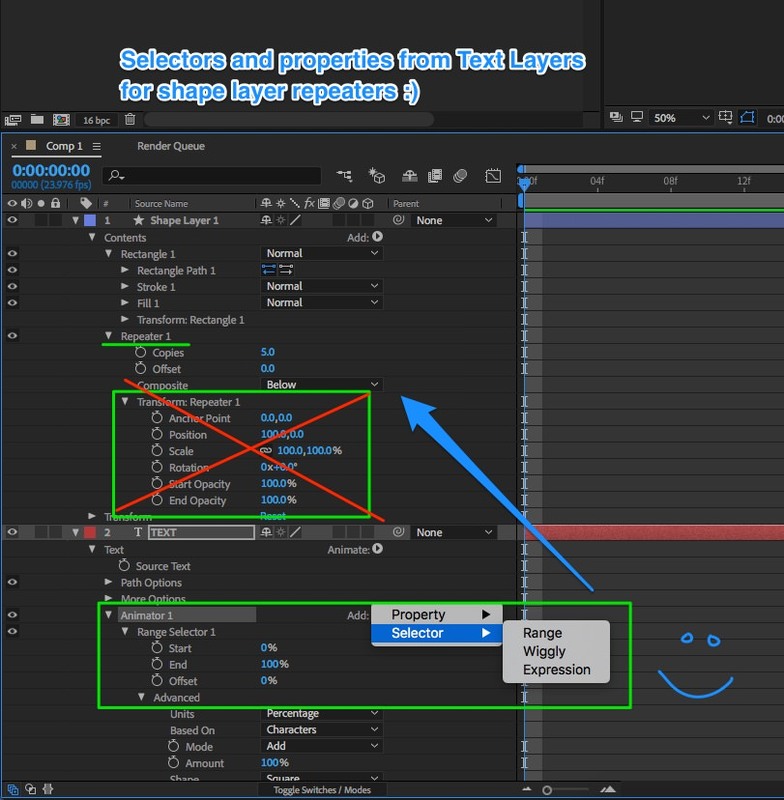 Think about other properties like shape layers for example and how easy it would be to just control their properties in the effect/properties panel! Animate and Photoshop are great tools for cel animation but both lack the usability for modern motion design workflows that After Effects would provide. Adding support for photoshop-style raster animation in After Effects would bring this powerful technique into the right environment, and add features useful for unrelated workflows. - Painting pixels not strokes. - Focus on speed, quality and tablet pressure/tilt support, NOT editability. - Ideally you'd be able to paint into both the layer viewer and the comp viewer if you want, so you animate in context of other layers. - This should be done on the effect level like 3D Camera Tracker points, so it's there when you need it (when you have the effect selected) but doesn't get rendered. - Options for duration, opacity, and incoming/outgoing colors. - The current paint effect adds a new property group for each stroke. Instead, the "Frame Paint" effect would work entirely in one property, whose "keyframes" are actually image sources. In the timeline and in the layer viewer, these keyframes would be presented as cel frames (similar to the photoshop timeline) with adjustable duration. The interface would also allow for draggable reordering of frames without risk of overwriting an existing frame, but other than that, they're basically hold keys under the hood. The image data could be held as raster images inside the AEP or even in a sidecar PSD file. Finally, and vitally... the Brushes panel should accept tool presets with access to cloud presets. Because who doesn't want Kyle Brushes in After Effects? Shape layers could really use some love. I propose that the same way we add selectors and properties to Text Layer animations, should be used for Shape Layer Repeaters. Draw a square, repeat it 10 times, now add a range selector with position and scale. think of the cool mograph type effects you could create with that system, The best part, is that Shape Layers and Text Animators are practically cousins, so I don't think it would be to hard to implement. Bonus would be to also have the same path options that Text layers have as well, imagined if you could repeat along a path!!!!! so many possibilities. Also wiggly and expression selectors would open up so many new doors. Would love to be able to make the stroke of a Shape Layer a gradient. Even if it was just a two-color gradient from one end to the other, that would be great. If it could be RGB and Alpha, even better! The gradient could be oriented from one end of the spline to another, or along the width of the stroke. In C4D you can 'mute' keyframes - essentially this acts like deleting the keyframe except that a dummy 'reference' key is left there, perhaps greyed out, that stores the value(s) and interpolations it had before it was muted. Keyframes to either side behave exactly as if it was not there, until it is un-muted. A way to parent multiple keyframes to layer markers would be fantastic. For example, having several animations that use multiple properties with different start points across a number of layers, it becomes laborious to adjust all of the timings quickly. Moving a layer marker and adjusting all of the keyframes, while keeping the timing the same between them, would be very handy! The plugin Animation Composer from MrHorse has this functionality already, but you can only do it with the set animations within the plugin. Mute/deactivate the keyframes of a specific parameter, ie. the position parameter of a certain layer. The keyframes would still exist, and possibly still be visible in the timeline, but they don't affect the composition while muted. F9 and Shift F9 (I have set to easy-ease in/out) is the most used key on my keyboard. How about Instead of opening curve editor and clicking and dragging to modify the ease-in and out, you just press it again, to incrementally add a little more ease, and maybe have a modifier key to subtract a little ease. Easy enough right? The Number effect is now practically useless, considering it stops at 30.000. It would be nice to have a quick and easy way to make counters with separtors (like in "1,000,000,000", it's kind of annoying having to use an expression for this). Same problem goes with the "time" option : you're pretty much screwed if you need a 1 hour countdown for example. I know this can be done with expressions, but it would be nice to have an advanced Numbers effect built in ! In most 3d programs (3dsmax, c4d...maya) there is an FFD tool that allows you to set a cage that causes deformation when the affected object passses through it. the cage position is independent of the object. This allows you to deform the object as it passes through the cage--picture a thick viscous fluid squeezing to fit through a funnel and then regaining its former shape once out of the funnel. Pixels are affected as they pass through the cage. Current options like puppet and mesh warp's positions are tied to your object and cant achieve this same effect. It is beyond me why Adobe would remove features. In the least there should be an easy work around, and not force you through hoops (re-installing old versions, encoding multiple times, etc.). These are features I have been using for 20+ years and to suddenly remove them is very disruptive. At least provide a conversion app. I think Adobe and Apple are still not getting along. Back in the Flash days, you've had put the current time indicator of a certain place in the timeline and hit F5 and it would insert frames and push everything after the current time indicator back in time. Hold shift F5 and it would insert 10 frames at a time, pushing everything back in time after the current time indicator. To me it's unbelievable that after effects has no support for inserting or removing time within a timeline. Many times I've had clients want to insert or remove something in a long complicated timeline, and it takes me the whole day just remove all the keyframes and do all the work. It's kind of a nightmare. Current workarounds are kind of a joke. Precomping and then using time remapping is not a solution. The 3 keyboard shortcuts to set Easing motion (F9 for EasyEase, ShiftF9 for EaseIn and ShiftCmdF9 for EaseOut) do not work like expected. E.g. when a keyframe is already Easing in, ShiftCmdF9 results in an EasyEase keyframe, in stead of switching to EaseOut. It adds the EaseOut to the EaseIn. These shortcuts would be of more use when doing what is promised. After Effects needs to have an option to export an Animation as SVG. SVG in comparison to GIF has much better quality and smaller File Size. An option to export animations as SVG would revolutionize everything. For After Effects and Web-Design. I would like to be able to coordinate external objects with text animations. Specifically I would like to have an arrow pointing at the currently selected line of text. In order to do this I would like to be able to access the bounding box for the selected text inside an expression. Currently text animators can select based on characters, words and lines. The ability to select by paragraph would be extremely useful for things like slideshow bullet points. The current workaround involves manually splitting up paragraphs, positioning them, and key-framing them independently. This is quite time consuming. With After Effect's versatility, it surprises me that the workflow doesn't lend itself well to any kind of hand-drawn animations. One of the most simple ways I can think of to make AE more viable is just to allow onion skinning when painting frame-by-frame with the brush tool. As it stands right now I mostly have to guess and hope I got my drawings right. Thank you for filing this request. We have logged an internal feature request for adding support to the Animation codec for both encoding and decoding delta frames (a.k.a, the “Key frame every X frames” option). It is currently under review for future updates to the Adobe DVA products. At this time I can not share a timeline for when this might happen. I have always found it frustrating that you can not alter a layer in 3D at all. You can work with a 2D flat video layer but you can not deform it at all in the z axis. This would add the ability to treat a layer more like a face in a 3d app like Maya. You could add points and move them forward or back in z space like the puppet tool only not limited to x and y values.